To get started - choose a foot. Phil Smith of Wrights & Sites' fame (and otherwise known as Crab Man, Mytho and Anton Vagus) is not the first to walk in the footsteps of W.G. Sebald, whose The Rings of Saturn is an account a walk round Suffolk 20 years ago. 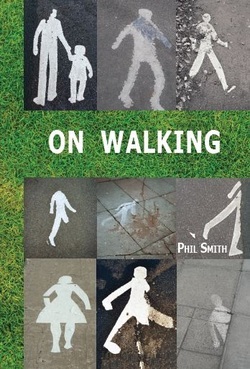 What is remarkable is that Phil's own walk was quite as extraordinary as Sebald's and that he matches Sebald's erudition, originality and humour swathe for swathe. On one level On Walking... describes an actual, lumbering walk from one incongruous B&B to the next, taking in Dunwich, Lowestoft, Southwold, Covehithe, Orford Ness, Sutton Hoo, Bungay, Halesworth and Rendlesham Forest - with their lost villages, Cold War testing sites, black dogs, white deer and alien trails. "If your walking is part of someone else’s machine, if you have already donated your body, with or without its organs, to routines, chores, necessities and obligations; then walk this way. If, when you do have free time you ‘spend’ it following maps, guidebooks and timetables, travelling to events with fixed locations and start times, keeping to footpaths and off the grass, completing and competing, always knowing where you are going to end up; then walk this way. For there is a ramble inside the ramble; a shadowy path to be found hidden inside every guidebook (including this one)." On Walking... and Stalking Sebald is a book for walkers and ramblers, admirers and decriers of Max Sebald, Situationists and dérivistes, artists and [site-specific] performers who use walking in their work, students who are discovering and studying a world of resistant and aesthetic walking, anyone troubled by official guides to anywhere, geographers, urban explorers and activists who don’t want to drive to the revolution.